It is a wise old adage that the better the architecture, the harder it is to photograph. The same could be said of installation art: the spatial, immersive, physical experience of the building or environment is impossible to capture in imagery, one has to be there with one’s own body, and all one’s senses, to feel its real resonance. This is particularly true of the art of Leandro Erlich, the Argentinian master of metaphysical trompe l’oeil whose work is among the most photographed, but yet it cannot be fully enjoyed, or even just understood, by images alone. Erlich is already a superstar in Japan, so it makes complete sense that his first major retrospective, the most complete exhibition of his oeuvre, should take place at the Mori Art Museum, Tokyo’s most prestigious contemporary art center. 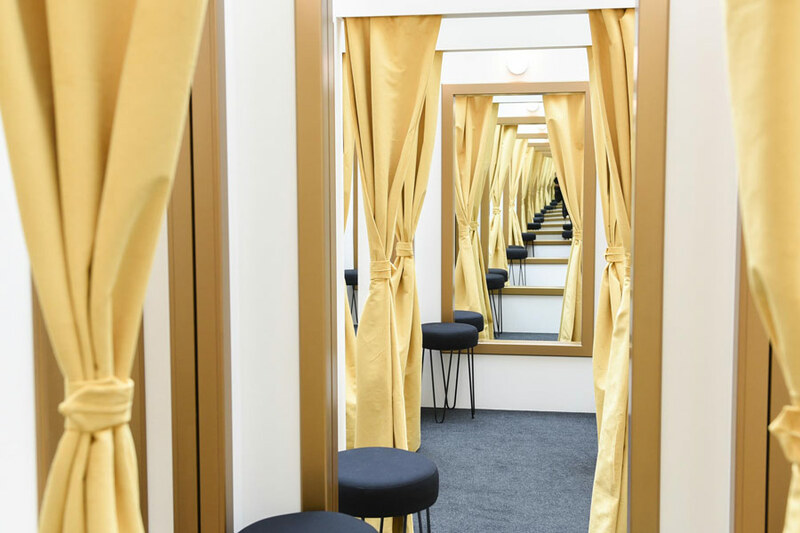 The show, Leandro Erlich: Seeing and Believing, is already a jam-packed mega-hit, with a projected total of 400,000 visitors by the time it closes, appropriately, on April Fool’s Day 2018. Most visitors take photographs, yet even as the circulation of images on social media reflects the success of contemporary exhibitions today, it is difficult to genuinely experience Erlich’s works through Instagram (or through reading a review like this one). For example, the last and most dramatic work of the show, Building, appears entirely dependent upon photography. First created in 2004, the work depicts a classic Parisian apartment block laid out on the floor, and visitors are encouraged to strike poses and disport themselves on the facades while a giant angled overhead mirror reflects them in defiance of all gravity. At the beginning of the show, the Mori Museum provided special photographers to take pictures for visitors on the work, as obviously they could not otherwise capture themselves in action. These images serve as the successful culmination to the show, proof of participation and obligatory digital souvenir. As the title of the exhibition makes clear, however, you really have to see Building yourself, and enjoy the actual physical interaction for it to mean anything, to transcend Photoshop trickery and move beyond the flat photographic plane. The Mori is an appropriate venue for Erlich because all his work is predicated around ‘architecture’ in the widest sense, the profession practiced by both his father and brother, which he himself extends into ambiguous, ambitious zones of the ‘reflective’ and uncanny, somewhere between Piranesi, Dan Graham, and M.C. Escher. The Mori was created by a great lover of architecture, indeed the very next exhibition at his museum is Japan in Architecture. This was the eponymous Minoru Mori who, as one of Tokyo’s most successful builder-developers, also created the most important private collection of works by his hero Le Corbusier, some of whose paintings are on display at his Ark Hills Club. For his Tower, famous for the best observation deck over the entire city, Mori chose retail architect Jon Jerde, (who collector Steve Wynn called "the Bernini of our time"), a designer whose practice could be profitably compared to that of Leandro Erlich. Indeed Jerde, who spoke about himself as a place-maker or a creator of experiences rather than a builder of buildings, could almost be describing Erlich’s work when he stated that his own work "[put] people in a popular and collective environment in which they can be most truly and happily alive." For people are indeed clearly happy, vocally alive, as they move through Erich’s lavish exhibition, enjoying one surprise after the other, a quite literal buzz of disbelief and delight at each mind-boggling encounter. Here no expense has been spared, with each work built just for this show and each given sufficient room to breathe, properly separated from the next. There is also a new work specifically made for this occasion, The Classroom, where thanks to a sheet of ultra-reflective glass, visitors find themselves, or their ghostly echo, sitting in the middle of a typical Japanese school from their youth. Another highlight in a show which is nothing but highlights, is Changing Rooms which are exactly that, an extensive labyrinth of boutique cells, some of whose mirrors turn out to be empty doorways through which one can climb, others of which are actual mirrors, producing the most baffling and exhilarating of journeys as one apparently clambers through oneself. Every architecture student, or indeed amused elder practitioner, should have the chance to experience Erlich’s work, which is the most literal and resonant demonstration of the transformative psychological possibilities of built space. Although he starred in the Whitney Biennial back in 2000, a proper American exhibition is long overdue, ideally with an essay by Anthony Vidler, that fellow wizard of the uncanny. Leandro Erlich: Seeing and Believing, is on view at the Mori Art Museum through April 1. For more information, visit mori.art.museum/en. 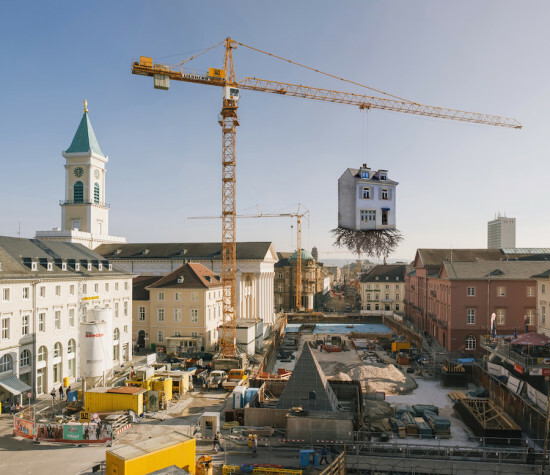 A house “mistakenly” unearthed from the soil by an inebriated crane driver hangs mournfully over a construction site in Karlsruhe, southern Germany. Torn roots sprout from its base to remind onlookers that it was once a happy home before its violent extrication. The hyper-real sculpture by Argentinian artist Leandro Erlich is suspended above a market square, where construction for a new tram network is in full swing. While it might appear to critique the built environment and associated human errors, the model house is intended to challenge resident’s perception of construction as an eyesore and something “divorced from the natural world.” "Pulled up by the Roots highlights this tension,” Ehrlich told Dezeen. “As living beings on an ever-changing planet, we can never be apart from the organic world; the architecture that we create is part and parcel of our environment." Inspired by the historical architecture of Friedrich Weinbrenner, Erlich’s reality-bending art addresses global themes of uprooting and migration, but it’s also there to remind people that “underneath the tons of metal and concrete of our cities, a vital organic presence remains.” Therefore, the roots are a sign of life and not destructive intervention. Pulled up by the Roots is part of The City is a Star, a series of realistic sculptures installed across Karlsruhe to commemorate its anniversary. Another spectacle to behold is a comically bent truck by Austrian artist Erwin Wurm, whose rear wheels seem to be kicking off from the building behind it like a bucking bull. The artwork truck was recently slapped with a parking ticket, according to CityLab, but a report from KA News insists that the gag ticket was issued by a rare breed of city officials possessing a sense of humor, after the Center for Arts and Media (ZKM) publicly complained about having to pay the charges. The sculptures will be on view until September 27, 2015. Another satirical outlook on human foul-ups is a topsy-turvy pile-up of VW Beetles by Hans Hollein, titled Car Building. Were they also victim to the drunken crane driver’s clumsy hand?